Super Bowl 2012: What's in the Giants, Patriots, 49ers and Ravens' Name? 1. American Football League (1926), American Football League (1936–1937), American Football League (1940–1941), All-America Football Conference (1946–1949) None of them had the financial muscle and the organizational skills behind them that Lamar Hunt’s American Football League, had. 2. One of Commissioner Pete Rozelle’s suggestions for the name of the new game was "The Big One." That name never caught on. “Pro Bowl,” did not work. “World Series of Football.” That died quickly. It was deemed too imitative of baseball’s Fall Classic. 3. Quarterback Bart Starr of the Packers on Vince Lombardi: It was a fabulous experience all of us had playing for him, being coached by him. I could hardly wait for the next morning to get into the meeting to start that day off. He made everything so exciting, so challenging. He was a brilliant teacher and because of it he was a fabulous coach. 4. KC player ED LOTHAMER said of Kansas City Coach Hank Stram: There were times when he had practices and a band playing. If an entertainer or celebrity was in Kansas City, often they would call Hank, and Hank would invite them to come over and watch practice. People like Muhammad Ali, Jim Nabors, Al Hirt, Edie Gorme and Steve Lawrence, all watched us practice. You never knew who was going to pop up. 5. 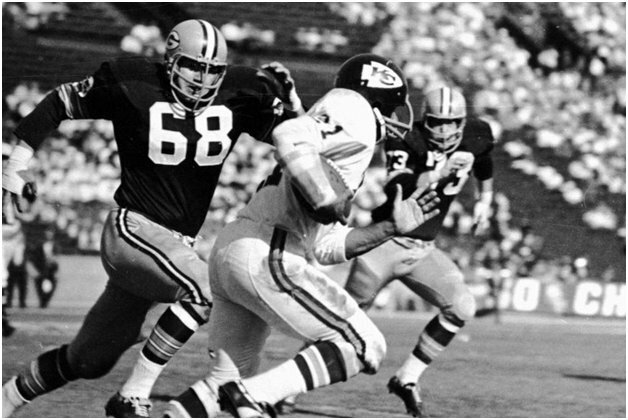 Prior to that first Super Bowl Game on January 15, 1967 – the Packers and the Chiefs has never played against each other. Actually, no NFL team had ever played against an AFL team – even an exhibition game. 6 The Saturday night before the game even chubby Jackie Gleason, one of the famed comedians of that era, got into the act by ending his CBS television urging his huge audience to make sure to tune in the next day to CBS and watch the world championship football game. There were those who thought “The Great One” went a bit too far, that he was too much of a shill for his CBS network that carried the NFL broadcasts. 7. Some celebrities of the time at the game included: famed movie and TV stars Henry Fonda, Kirk Douglas, June Allyson, Janet Leigh, Chuck Connors, Danny Thomas, CBS TV anchor Walter Cronkite, comedian and serious sports fan Bob Hope, late night TV host Johnny Carson. 8. Two different footballs were used in the game. When the NFL Packers were on offense, they used the NFL ball and when the AFL Chiefs were on offense, the AFL ball was used. 9. Two kick-offs incredibly took place to start the game’s second half because NBC-TV was in commercial for the first one and a “do over” was allowed. 10. Commissioner Pete Rozelle’s wish was that the game would one day surpass baseball’s World Series. It would do much more than that. With that first game history - The Super Bowl has evolved into the grandest, grossest, gaudiest annual one-day spectacle in the annals of American sports and culture. All of this incredibly spun off the game that was played that January day in 1967 at the Los Angeles Coliseum, a game that for a time lacked a name, a venue, an identity, a game that didn’t even sell out. Written by acclaimed sports author and oral historian Harvey Frommer, with an intro by pro football Hall of Famer Frank Gifford, When It Was Just a Game tells the fascinating story of the ground-breaking AFL–NFL World Championship Football game played on January 15, 1967: Packers vs. Chiefs. Filled with new insights, containing commentary from the unpublished memoir of Kansas City Chiefs coach Hank Stram, featuring oral history from many who were at the game—media, players, coaches, fans—the book is mainly in the words of those who lived it and saw it go on to become the Super Bowl, the greatest sports attraction the world has ever known. Archival photographs and drawings help bring the event to life. Dr. Harvey Frommer is in his 39th year of writing books. A noted oral historian and sports journalist, the author of 42 sports books including the classics: best-selling “New York City Baseball, 1947-1957″ and best-selling “Shoeless Joe and Ragtime Baseball,” the acclaimed Remembering Yankee Stadium and best-selling Remembering Fenway Park. Frommer mint condition collectible sports books autographed and discounted are available always from the author.